We first discovered Moire O’Sullivan on reading her 2011 book, Mud Sweat & Tears, an inspiring account of the author’s journey to become one of Ireland’s best mountain runners. It’s a book that makes you at once admire her talent and achievements, while also realising that if you really want to achieve your dreams you mostly need determination and hard work. Fast forward a few years (and some major life events) and Moire’s next book, Bump, Bike & Baby, is out this week. Read on for our review and a Q&A with the author. 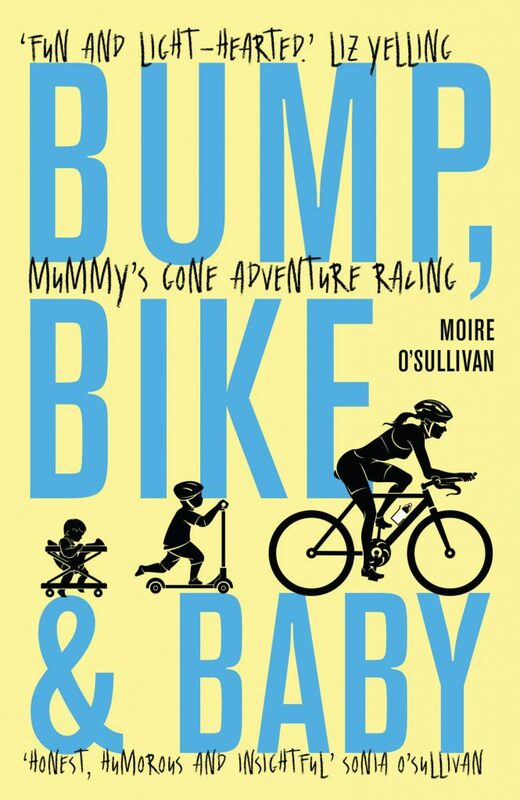 Bump, Bike & Baby is an engaging read that follows Moire on her voyage of self-discovery from child-free mountain runner to the moment she wins the 2016 Irish National Adventure Race Series as a mother of two. The story begins with Moire talking about her fears about starting a family as she watches her friends disappearing one-by-one from the mountain running scene to have babies. We meet Pete, Moire’s supportive but family-orientated husband, and gather an insight into the couple’s pre-child life, and the passion Moire has for her sport. The discovery she’s pregnant isn’t a straightforward one, as Moire struggles comes to terms with her new identity as a mum-to-be and deals with the emotional and physical turmoil of early pregnancy. But there’s a clear point of acceptance, helped by the acquisition of shiny new Bike, and some interesting and informative details about the practicalities of life and training with a bump, a baby and beyond. Overall a highly recommended book – enjoyable and lighthearted, yet honest and up-front – dealing with some difficult topics with insight and a good dose of humour. What would be your top three pieces of advice for juggling young children and training? My husband, Pete and I have had many conversations about how to help each other cope with parenthood. In particular, Pete knows how hugely important training is to my psyche. Having a supportive partner, who understands that I need a daily break from motherhood in order to train, is a major component in helping me strike that balance. However, I’m well aware that not everyone has the luxury of a flexible and supportive domestic arrangement, and indeed there are other ways to balance training and parenthood. When my first born was four months old, I bought a Bob Revolution running buggy, an amazing contraption designed for high-speed, off and on-road running with a baby. This was the perfect way for me to get out for a jog without childcare. And more often than not, Aran fell asleep on the run. If going outside isn’t feasible, a set of biker rollers is worth their weight in gold. In my case, they were a present from my husband for giving birth. I would put Aran in a jumperoo, or wait until he was having a nap, and then would do an indoor bike session, while keeping an eye on him. If a buggy or bike rollers are cost-prohibitive, strength and conditioning exercises at home are a brilliant way to get in shape again. Squats, lunges, press-ups, and skipping are great to keep fit and put a post-natal body back in some sort of shape. I feel the biggest parenting challenge is just being time-poor, and there are really no easy answers to this. My sincere belief though is that a happy parent makes a happy child, and if this means taking time out for yourself, even thirty minutes a day, then it will probably go a long way to creating some sort of household harmony. Your first book, Mud, Sweat & Tears, was about your inspiring journey to become a mountain runner and subsequent completion of the Wicklow Round (Moire was the first person to run the 100km circuit of Ireland’s Wicklow Mountains in under 24 hours). Are you tempted by any of the other big mountain rounds? I completed the Wicklow Round in 2009, nearly ten years ago. Since then, I’ve been busy doing a host of other things with my life, like living and working in South-East Asia, starting a family, and doing one-day adventure races. Even if I had wanted to do another Round, I just wasn’t living in the right place, or just simply didn’t have the time or energy to prepare or attempt another one. Fortunately, this year, things have changed. I now live in Northern Ireland, at the foot of the Mourne Mountains. A couple of years ago, the Denis Rankin Round was inaugurated, a circuit of all the peaks in the Mournes over 400 metres in height, covering 90 kilometres and 6,500 metres in ascent. Denis Rankin himself was a pioneer in fell running and mountain marathons in Northern Ireland since the 1970’s. He tragically died on 16 May 2013 while competing in a fell race on Slievemoughanmore, one of the peaks on this very Round. I recently watched a video by Nevis Landscape Partnership documenting Alicia Hudelson’s completion of the Scotland’s Ramsay’s Round in 2017 (https://vimeo.com/247954077). For me, this production truly captures the mud, sweat and tears of undertaking such a daunting challenge. Watching it reminded me how much I love doing Rounds. So if the moon is full and the weather is kind, I’m hoping to attempt the Denis Rankin Round later this year. There is definitely something about Rounds that speaks deeply to me. I love the fact that you can attempt the challenge at any time during the year. I also like that you can choose your preferred format, whether it is with a group of trusted friends or running alone and enjoying the solitude. And I love the fact that it is not a race. It is just you putting yourself out there at the mercy of the mountains, asking them to allow you to cover their hallowed ground within the construct of one day. 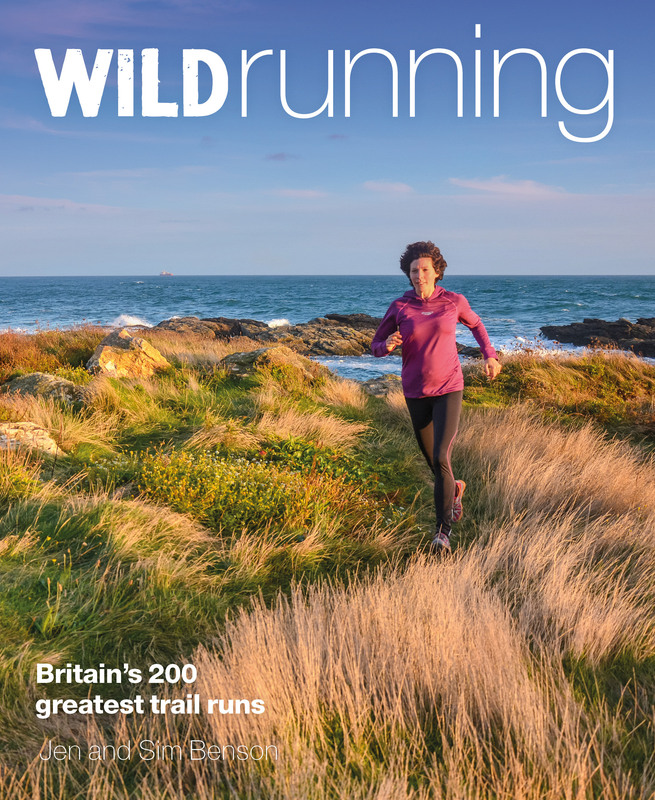 Where are your favourite places to run? And where are the best running spots in Ireland? 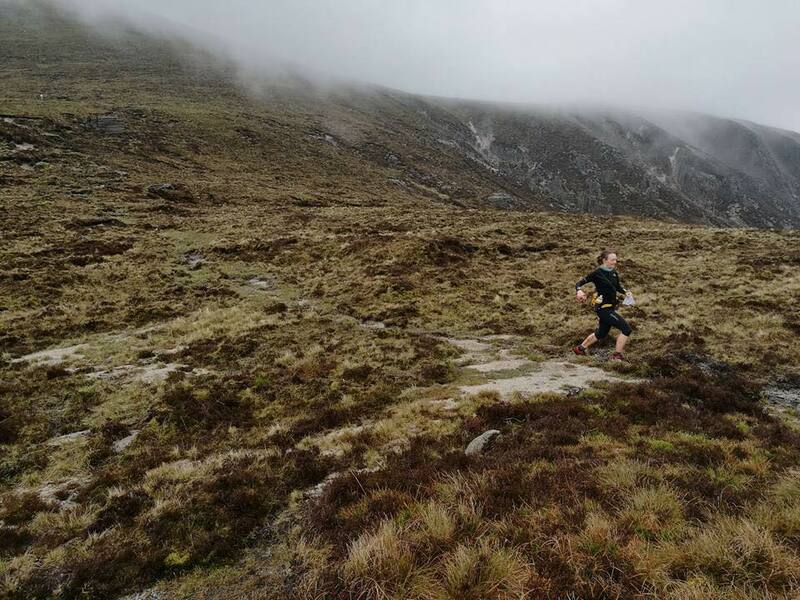 There are a host of other mountain ranges around Ireland that are brilliant to run around, but often require good navigation skills due to the lack of distinct trails and our dodgy, misty climate. I am particularly drawn to the Comeragh range in Waterford, where rough terrain gives way to spectacular views of glacial lakes hewn out from the mountain rock. Northern Ireland offers a host of great places to run as well. I love the Mourne Mountains with their formidable granite summits and valleys, and the fact that you can quite easily run back to Newcastle for nice coffee and cake. Formidable stonewalls traverse the range to protect the water catchment areas and link many of the major summits together. These walls serve as great navigational aids. Thanks Moire and all the best with the book and your future athletic and family endeavours! In Bump, Bike & Baby, Moire O’Sullivan charts her journey from happy, carefree mountain runner to reluctant, stay-at-home mother of two. With her sights set on winning Ireland’s National Adventure Racing Series, she manages to maintain her post-natal sanity, and slowly learns to become a loving and occasionally functioning mum.